A flight deck sentry as Ark Royal transits the Suez Canal - 1st February 2003. 11th January - Sail from Portsmouth. 13th - 16th January - Ammunition ship at Glen Mallen Armament Depot. 15th January - Embark COMATG Staff, Delta Company of 42 Commando Royal Marines and 29 Commando Regiment, Royal Artillery. 20th January - Transit Straits of Gibraltar. 27th - 30th January - Conduct assault training off Cyprus. 1st February - Suez Canal transit. 9th February - Transit the Straits of Hormuz and enter the Persian Gulf. 10th February - Arrive in the SEAHAWK Exercise Areas off the United Arab Emirates for amphibious training. 2nd March - Royal Marine Band concert in the hangar for the Ship's Company and Embarked Forces. 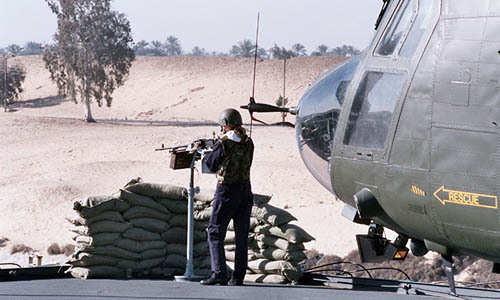 20th March - Military campaign against Iraq commences. 21st March - Ark Royal's embarked troops land on the Al Faw Peninsula. 11th April - Stand down from Op TELIC duties. April - Two day visit to Salalah, Oman (50% leave). 29th April - Arrive in Palma, Majorca for an informal visit. 4th May - Embark 800 Naval Air Squadron ground crew. 5th May - Sail from Palma for fixed-wing flying exercises. 14th May - "Ark Royal's Top of the Pops" show (sods opera) in the hangar. 13th - 15th June - Visit to Greenock. 15th - 17th June - Ammunition ship at RNAD Coulport. 4th July - Families Day at sea. July - Captain Adrian Nance joins as Commanding Officer. August - Portsmouth for maintenance and leave period. 10th November - Sail from Portsmouth for Shakedown period. 15th - 17th November - Visit to Amsterdam. 19th - 25th November - Visit to North Shields (includes Ship Open to Visitors). 5th December - Portsmouth for Base Assisted Maintenance Period and Christmas leave.